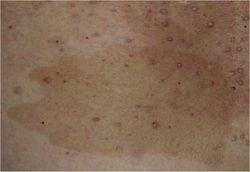 Cafe Au Lait spots and tumors on the back of a person with neurofibromatosis. Neurofibromatosis is a neurological disease, which results from genetic mutations on the NF1 and NF2 genes. There are three types of neurofibromatosis: NF1, NF2, and Schwannomatosis. NF causes tumors to develop on nerves throughout the body. Neurofibromatosis affects skin, bones, body size and proportions, muscles, and practically every other area of the human body. Currently, there is no cure for NF, but researchers have found ways to relieve the symptoms. Joseph "The Elephant Man" Merrick. Neurofibromatosis supposedly dates back to the thirteenth century. It is previously known as von Recklinghausen's neurofibromatosis, after Frederick von Recklinghausen who is credited with its discovery. In 1882, von Recklinghausen first wrote about the disease, describing two different cases of neurofibromatosis. As the National Center for Biotechnology Information describes, "He postulated that tumors along major peripheral nerves and also false skin neuromas originate from the connective tissue of nerve sheaths and nerve plexuses, particularly perinerve and endonerve. He also described pigmented skin areas, but he apparently did not include "café au lait" spots as part of the disease. He stressed that central nervous system tumors were rarely accompanied by skin manifestations". In the late 1800's, Joseph Merrick was misdiagnosed with NF, and presented in circuses as "The Elephant Man", causing a bad name for the disease. It was later discovered that Merrick did not have NF, but Proteus Syndrome..
Neurofibromatosis results from the genetic mutations of the NF1 and NF2 genes. NF1 is transmitted on chromosome 17, while NF2 is transmitted on chromosome 22. Since Schwannomatosis is so rare, researchers are not completely sure what causes the symptoms, but have found a mutation on the SMARCB1/INI1 gene that is linked to the disease. NF may be inherited, especially if a parent or grandparent also had the disease. The gene might mutate unexpectedly, causing NF even if previous generations never had it. Neurofibromatosis affects all people of all ethnic groups equally. A woman with tumors on her face, caused by NF. The symptoms of neurofibromatosis vary depending on the different type contracted. Symptoms of NF1, usually appear during childhood. These can include flat brown spots on the skin, freckling in the armpits or groin area, Lisch nodules (bumps on the iris of the eye), soft bumps on the skin or under the skin, deformed bones, tumors on the optic nerves, learning disabilities, large head size, and a below average height. NF2 causes tumor growth in the ears which leads to gradual hearing loss or ringing in the ears, headaches, and loss of balance. NF2 may also generate the growth of tumors on the cranial, spinal, optic, and peripheral nerves, creating numbness and pain, balance difficulties, vision problems, and facial drop. Schwannomatosis produces the development of tumors on the cranial, spinal, and peripheral nerves. It causes chronic pain, weakness, and numbness throughout the body, and loss of muscle. Neurofibromatosis can create many complications for a person and his family. The person diagnosed with this disease may feel self-conscious or insecure about their appearance and their difficulties in learning or thinking. NF may also cause skeletal, optical, cardiovascular, or respiratory difficulties, adding on to the pain and hindrance that already comes with the disease. Those with NF often experience seizures and a small percentage of people may also develop cancer. There is no cure for neurofibromatosis, but research has developed ways of easier diagnosis and methods of relieving the symptoms of NF. The sooner treatment begins, the better the outcome. Surgical removal of or stereotactic radiosurgery on tumors can lessen or completely relieve a person of the pain and complications on nearby tissue or organs caused by that tumor. If a person experiences hearing loss, a cochlear implant or auditory brainstem implant may be able to help. Radiation therapy, chemotherapy, and surgery are important in treating malignant (cancerous) tumors. Doctors may also recommend or prescribe several different pain medications to manage the symptoms of NF. Several people share their testimonies about living with neurofibromatosis. ↑ Mayo Clinic Staff. Overview Mayo Clinic. Web. Published December 24, 2015. ↑ Brosius, S. A history of von Recklinghausen's NF1. PubMed. Web. Published October 19, 2010. ↑ 3.0 3.1 Antonio, Joao Roberto, Goloni-Bertollo, Eny Maria, and Tridica, Livia Arroyo. Neurofibromatosis: chronological history and current issues PMC. Web. Published June 2013. ↑ Nordqvist, Christian. What is neurofibromatosis? What causes neurofibromatosis? Medical News Today. Web. Published May 9, 2016. ↑ Mayo Clinic Staff. Symptoms and Causes Mayo Clinic. Web. Published December 24, 2015. ↑ Mayo Clinic Staff. Treatment Mayo Clinic. Web. Published December 24, 2015. This page was last modified on 22 November 2016, at 12:53.